Just because I don't talk about it doesn't mean that I haven't spent the entire night having imagined conversations with you about it. So much of our lives is spent living inside our heads - it is difficult to calculate what things are important to us, where our passions lie and who we really are! So little of our preoccupations even exist outside of our heads. So many conflicts and arguments never actually happen - we imagine them all. Maybe the same can be said of love? Do we convince ourselves that we are in love when we are sitting alone, contemplating another person? Do we 'talk' ourselves into believing that that love is reciprocated? In 'The Wreckage', the main characters,Sadie and Wish, are separate for much of the novel, yet each cannot forget their passionate affair many years before. That intense encounter changed their lives completely, consumed their waking hours in the years since, and influenced the life-choices that they made. Crummey is forcing us to consider the great relationships of our lives in this novel. He is asking, are their people who mark us forever? Is there a great love for every one of us - a love that will alter our lives and who we are? Can another person have such an impact on another person's character? What is it that happens to us when we fall in love with another person - do we change and if so, is it for the better...? Human relationships are at the very heart of this novel set before and after the Second World War, and leading up to the present day. Crummey perfectly presents us with vibrant characters and cleverly makes us care for their welfare as they collide with one another and their lives become entangled. There is a young couple from divided Catholic and Protestant communities in a small Newfoundland town, and a Canadian Soldier and his Japanese prison guard, whose lives are as bound up together as are the lives of the young lovers. 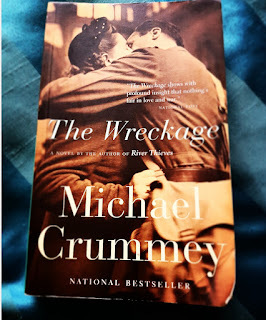 Crummey considers how lovers and enemies mark us in this life, how encounters can scar us and leave us reeling for years after, struggling to regain our ballast. There are people that we never get over meeting - some people whose voices we can never evacuate from our heads - this book deals with those human interactions. There have been endless encounters that have effected my life - countless encounters, countless kindnesses, countless cruelties. Aren't we all the same? Grandmothers, aunts, sisters, teachers, pupils, sons and daughters whose comments still ring in my ears years later - and that is just it... How many of our interactions with others are only brief encounters, that reverberate at length in our minds. In Crummey's novel, the male protagonist, Wish, is haunted by a single comment that his girlfriend said to him, "Don't make a whore of me." You can imagine how a young Catholic might find that line particularly jarring, just as he was about to do exactly that. He is also burdened by memories from his time as a prisoner of war in a Japanese internment camp and later in Nagazaki, when the atom bomb was dropped. The memory of seeing a dead woman with a living infant feeding at her cold breast is just that kind of image that is central to the Catholic preoccupation with the Madonna and child. In fairness, this image is one of the most disturbing of the book, but there are more that I cannot mention here. Crummey has certainly written a love story here - but the novel works on so many levels, symbolism and philosophical questions are never too far from the surface, and that is what makes this text so extraordinary. Expect suffering, great passion, long distances and short conversations, unanswered questions and shocking revelations - presented in the masterful language that we have come to expect from this wonderful writer, and you will have an idea of what 'The Wreckage' has to offer. It's a great book - what else is there to talk about?